Home/NRP or PALS: Which One Is Right to Use? Pediatric health care is an exciting field in which you get to care for the youngest members of your community. These children often deal with unique diseases, acute concerns and autoimmune conditions that may act far differently than their adult counterparts do. Therefore, when you become a neonatal or pediatric doctor, nurse or other health care practitioner, you’ll want to be aware of some of the key differences in medicine and in life-saving care for this population. Some of the most important differences are in the areas of emergency medicine and resuscitation. An adult’s body is bigger and stronger and reacts differently than a child’s body does to life-saving medications. While a BLS certification will give a few key differences in emergency care for infants and children, you’ll definitely want to take a more in-depth class if you plan to work mainly with this population. If your line of work has you practicing frequently in a delivery room or a newborn nursery, the NRP certification from the American Academy of Pediatric and the American Heart Association is a no-brainer. NRP stands for the Neonatal Resuscitation Program, and you can earn an NRP certification by successfully passing the Integrated Skills Station at the completion of the program. During the NRP program, you’ll mainly look at resuscitating newborns who are struggling to breathe, which is a common occurrence for some babies, especially those who are premature, immediately upon being born. You’ll also brush up on neonatal chest compressions and resuscitative medications and will learn about ethical considerations for end-of-life care for the newborn population. PALS, or Pediatric Advanced Life Support, is put out by the American Heart Association to provide guidance for emergency care for the older pediatric population. It’s an instructor-led course that mirrors the content of ACLS courses for adults but with an emphasis on younger patients. When you take this course, you’ll learn life-saving algorithms, medication amounts for children, fast pediatric assessments and team dynamics appropriate for advanced support of the patient. The PALS course usually takes more time than the NRP course does and provides more practice stations along with a written test and a skills test. To get your PALS certification, you’ll have to score a minimum of 84 percent on your written test and will need to perform BLS skills for children accurately as well as complete two hands-on PALS core case scenarios while participating as a team leader. 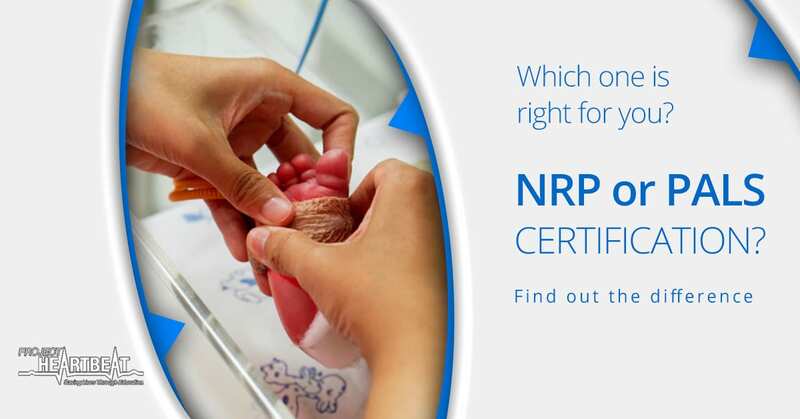 Of course, if you care for a large pediatric population in a smaller setting, such as in a community hospital or in a pre-hospital setting, you’ll definitely want to consider getting certifications in both NRP and PALS so that you are equally ready to care for newborns and children of all ages. As you can imagine, there are many differences between treating neonates and elementary-age children or teenagers. In particular, neonates are more apt to have respiratory issues, such as asphyxia, due to immature lungs than their older counterparts are. Plus, there are important differences in chest compressions and emergency medications to use. Getting both of these certifications under your belt can prepare you for all situations that could arise while you’re at work or when you’re out in your community. While PALS may seem like the first and most obvious choice because it can help in nearly any circumstance, don’t overlook the importance of NRP certification if you ever plan to work in a delivery room or care for newborns. Are you interested in NRP or PALS certification? Project Heartbeat offers NRP and PALS courses at our Oakland and Sacramento campuses for convenience. For groups of eight or more, we can provide on-site classes. Visit our course information pages for NRP certification and PALS certification to get started, or contact us to discuss your needs.